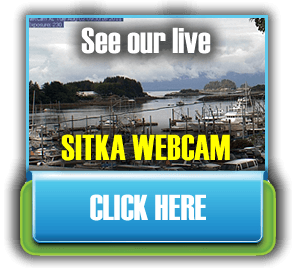 Sitka National Historical Park was established in the early 1900’s, making it Alaska’s oldest federally designated cultural and historic park. The goal was to preserve and interpret the last battle fought between the Tlingits and the Russians in 1804, known today as the Battle of Sitka. All that remains of this last major conflict is the site of the Tlingit Fort and battlefield. The park takes up over 100 acres of forest, river, shoreline, and the Russian Bishop’s House. In 1965, a new visitor center was opened. 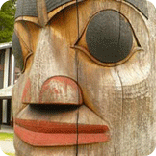 It contains many interesting exhibits and houses the Southeast Alaska Indian Cultural Center. The park was established on the National Register of Historical Places in 1966. 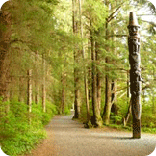 Wooded trails through the park bring you past a collection of restored and recreated hand-carved Haida & Tlingit totem poles. 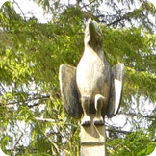 Most of the totem poles came from Haida villages located on Prince of Wales Island; others come from the display at the 1904 Louisiana Purchase Exposition. Interpretive signs tell you more about the poles and what they represent. Old growth Sitka Spruce towers overhead as you walk through the temperate rainforest. Ferns, shrubs, and flowers border the trail that leads to the place where the Tlingit fort used to stand. The self-guided walking tour is free and open to the public. The park, over the years, has been used for a variety of purposes such as picnics, battle memorial potlatches, gathering native plants, fishing, hunting and just enjoying the serenity and beauty of the area. 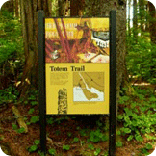 Guided ranger walks on various topics that are offered in the summer months. Please check with the park for their weekly schedule. May 1 – September 30: Daily, 8:00 a.m. to 4:30 p.m.
October 1 – October 18: Tuesday-Sunday, 8:00 a.m. – 4:30 p.m.
October 19 – April 30: Tuesday-Saturday, 9:00 a.m. – 3:00 p.m; Sunday-Monday, intermittently open, please call ahead for open hours (907) 747-0110. During winter months, the visitor center will be closed on Thanksgiving and Christmas. The trails will remain open.